It's time for another Moms of Master Books review, and a Facebook party is coming up tomorrow evening! I should even be there, for a change! 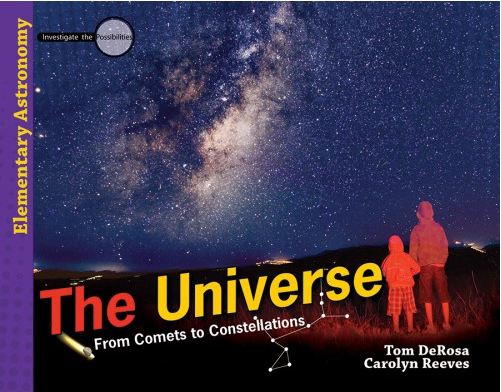 This month's selection is The Universe: From Comets to Constellations. I am SO excited to tell you that this around, we got the set of three books to review. This newest entry in the Investigate to Possibilities series by Tom DeRosa and Carolyn Reeves is definitely my favorite so far, and having the whole thing makes this mama very happy. Of course, now is where I confess that my kids have done nothing with this book. This review is totally based on my reading, not on my actual use. It has been an insanely crazy month, and then last week we took turns being violently ill. So rather than trying to cram something in and give a superficial review based on the first activity, I sat down and read a huge chunk of the material myself. I am so glad I did that, as I'm far more impressed with these materials than I would have been from just barely getting started. I think I own all of the main books in this series, so I thought I knew what to expect. I just recently reviewed Water & Weather, in fact. But as soon as I got a couple of pages in, I started noticing that this book is different. Oh, it still has the same basic layout and the same philosophy of teaching -- Engage the students, Investigate (do hands-on activities), then Explain (that's the academic teaching part), Apply (to other situations), Expand (if desired) and Assess. What struck me immediately, though, was how much information there is on scientists, and the detail on some fairly complex theories and ideas. Like Relativity. That got me looking into it a bit more, and while all the other titles in the series seem to be intended for grades 3-6 (and some of them, I think, are a bit light for those 6th graders! ), this one is listed as being for grades 3-8. I have a 3rd grader now (eeek! I am NOT ready to call her a 3rd grader), and I think she's ready for the concepts in this book. But... well, she's grown up listening to her big brothers casually discuss Doppler effect, inertia, gravity, red shift, Newton's Laws of Motion, etc. While there is plenty of new information in this book for her, and she is going to love it, very few concepts presented are totally new. I personally would not use this book with a more typical 3rd grader. Use some of the others, and come back to this one when they are a bit older. Unless, of course, the only thing that student wants to learn about science-wise is the stars and planets, and you are trying to go with their interests. The main book, which is all you truly need to use the material. This includes the text for the children to read (or you to read to them, as I tend to do), the activities, the digging deeper suggestions, etc. It is all in here. The Teacher's Guide, which I would highly recommend, especially if you feel a bit shaky about your knowledge of things like the Theory of Relativity. This guide has miniature student pages in it, along with some notes and THE ANSWERS to the What Did You Learn? sections. Just so you feel a bit more confident that you did grasp the concept yourself. Occasionally, there are also some comments about ways to extend some of the activities further. The Student Journal, which is nice for older students especially. I will have my 5th grader use this, but I have no plans to get another one for my 3rd grader. This includes places to document observations during the activity, and it also includes the What Did You Learn? questions, with blank lines for the student to answer. You can go see what other Moms of Master Books have to say about The Universe set. There is a Book and a Treat Facebook party coming up tomorrow, May 27 at 7 pm Central Time, where you could win cool prizes -- and discuss the series too. This looks really neat to me! I really do love this one! !